Helen Cohen is a Sherlock Holmes fan living in Somerset (England); Baptiste Marcel and she interviewed June Wyndham-Davies, producer of the Sherlock Holmes Granada TV show, in Portmeirion in August 1996. She also is a wondeful artist. Here is a few pieces of her work. 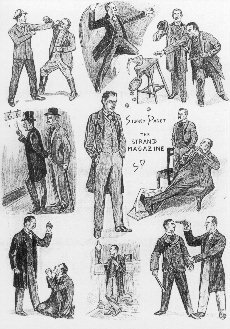 Various illustrations by Sidney Paget from the Strand magazine. Dr Watson (Nigel Bruce) and Sherlock Holmes (Basil Rathbone) in The Adventures of Sherlock Holmes. Dr Watson (Nigel Bruce) and Sherlock Holmes (Basil Rathbone) in The Pearl of Death. Dr Watson (Nigel Bruce) and Sherlock Holmes (Basil Rathbone) in The Hound of the Baskervilles. The Professor from The General. 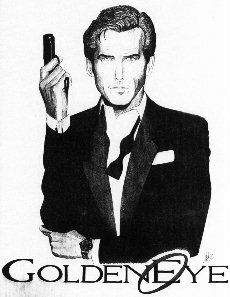 Pierce Brosnan as James Bond 007 from Goldeneye. Sean Connery as James Bond 007. Clint Eastwood from The Outlaw Josey Wales. Clint Eastwood as Dirty Harry. More about The Man from U.N.C.L.E. 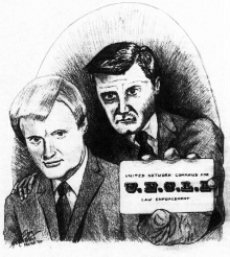 in French or in English on the kuryakin's Fan from U.N.C.L.E. site. The Avengers and The New Avengers; showing all the assistants. These drawings are copyrighted Helen Cohen, but are free of use for non-commercial purposes. You are welcommed to use them in your pages or you fanzines as long as you respect the pictures and credit the author properly (links to this page would be appreciated for Internet use). I£ you intend a more comer$ial u$e, please contact us (see below). File created 5th January 1997, last update 4th February 1997 by Baptiste MARCEL (voir page Contact), located in Nogent-sur-Marne (France). Feedback is welcomed.